One of my favorite things about sailing our schooner, Aquidneck, is that every time we go out, there’s always something new to see on Narragansett Bay. It doesn’t matter if it’s a Tuesday afternoon or a Saturday evening sail just before sunset, there’s always something unique that gives Rhode Island and its connection to the ocean just a little more depth. We’re so fortunate to have such a vibrant sailing scene in Newport. Whether it’s the wooden boats lovingly restored by the students at the International Yacht Restoration School, the huge maxi yachts that make their berth in Newport Shipyard, or the endless variety of modern one design sloops that launch out of Sail Newport, there’s no shortage of yachts to be seen on the bay. This summer I’m particularly excited for a handful of regattas that display the variety of sailing that takes place on the bay. Keep in mind these events are handpicked from a list of over 40 events from Sail Newport’s event calendar and also keep in mind that this doesn’t even include the weekly race series that 3-4 times a week in the summer just before sunset. I remember when the Volvo Ocean Race first came to Newport back in 2015. It was 10 PM, very dark, and I was on one of at least 200 boats in the bay all waiting to catch a glimpse of the ultrafast Volvo Ocean 65s scream past Brenton Point and making their finish into the bay. The only problem: there was no wind. Fortunately, it was a problem they would not face again as the next two weeks featured some amazing sailing, capped off by an spectacular send-off as the teams left Newport headed for Portugal, flanked by thousands of spectator boats on all sides. The best days to come to watch these boats on the water will inevitably be the In-Port Race on Saturday, May 19th and the Leg Restart on May 20th. 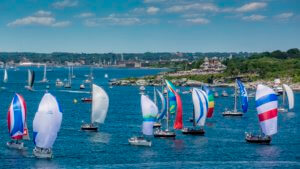 Because of the inevitable traffic on the bay, Schooner Aquidneck will have to sail a modified course so we don’t get in the way of the race boats, but you will certainly catch a glimpse while out on the water. There will also be lots of opportunities to watch these boats practice between May 15-18th and that the Race Village is free and open to the public for the entirety of the stopover. Held every two years, on even years, the 635-mile Newport Bermuda Race is one of the very few international distance races that exist. This year marks the 51st time boats from all over will gather on the starting line by the Inn at Castle Hill and take off for the sunny island of Bermuda. What makes this such an amazing event is that because there are 160-200 boats all clamoring to begin the race, the fleet start takes up to two hours to from beginning to end. One boat in particular to keep an eye out for is the 100 ft. maxi yacht Comanche, owned by Jim and Kristy Hinze Clark. She broke the record in 2016 for the fastest elapsed time from Newport to Bermuda, clocking in at 34 hours 42 minutes 53 seconds. To put this in perspective, most boats complete the race between 2-6 days and the previous record was 39 hours. Will she be back in 2018 to shave more time off her record? The best sail to catch the start will be the 11:30 AM morning sail on Aquidneck or on a Starlight private charter (10:30 AM or 1 PM). Organized by the Newport Shipyard, the Candy Store Cup takes the reins from a regatta that used to be called the Newport Bucket Regatta which itself used to be called the Candy Store Cup. The previous Candy Store Cup was open to boats of all sizes but the modern day Candy Store Cup is only open to yachts larger than 100 feet. If you’re in the mood for watching some of the most fantastic boats grace Narragansett Bay, this is the event to be out for. Some of my favorites include the schooner Naema, the schooner Meteor, and of course, the local favorite Whitehawk, which we usually see moored in the harbor all summer. OK, OK, we all know the America’s Cup hasn’t returned to Newport since 1983 (excluding that 2012 America’s Cup World Series event), but that doesn’t mean that the most iconic boats of a bygone era can’t still be witnessed in their glory. ’s Wharf or out on the bay, but during 12 Metre North Americans, there’s an opportunity to see up to 14-16 “Twelves” competing for the right to call themselves the fastest in the fleet. Keep in mind that during this regatta and all the others, we won’t make any special “exceptions” to see the boats race, but there’s a very good chance that we will see them on the water either up close or in the distance. For the 12 Metre North Americans, the best opportunity to see these boats is either on our morning mimosa sail (11am) or on an afternoon sail to catch the boats making their way back to the dock. If you are interested in reserving a private charter for race viewing please visit our Private Charters page and fill out an inquiry form or call John Hirschler (401) 862-4718. Tickets for public sails on Aquidneck and Sightsailer will be available 21 days and 14 days prior, respectively, and can be purchased online here. For the complete list of regattas in Newport for the upcoming season please visit Sail Newport.